Is falling recycling rate due to ‘green fatigue’, or is there just less waste to recycle? 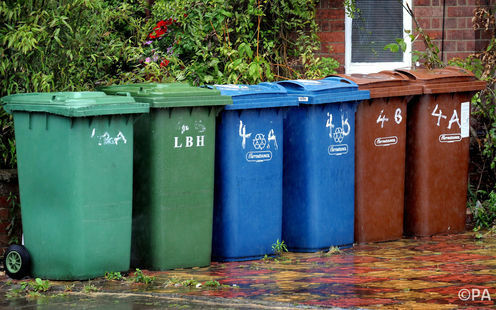 It’s been suggested that a recent fall in recycling rates is due to green fatigue, caused by the confusing number of recycling bins presented to householders for different materials. Recycling rates would rise, according to waste recycling firm Sita UK which carried out the survey, if the process was simplified, for example by collecting all waste for recycling together (known as co-mingling). But the same survey also found that reduced glass and paper consumption had led to a drop in the volume of those materials collected. Perhaps this is the underlying issue and not “green fatigue”. It is well known that fewer people are buying newspapers and that many products previously sold in glass, such as milk, are now sold in plastic. Thus, lower consumption of products in previously widely recycled containers leads to less waste and may be causing lower recycling rates. So is this really a cause for concern, if the drop in recycling rates is down to there being less waste generated in the first place? Well, yes, if this means the 2020 target of 50% household recycling is not met. In that case, the UK government will be fined, and this may affect householders indirectly through higher taxes or lower provision of public services. However, this concern may be misplaced and perhaps is more to do with the way the target is defined, rather than recycling levels. The relationship between recycling and the waste we generate implies that a drop in the amount of waste produced or an increase in less-recyclable material will lead to a fall in recycling volumes and possibly a drop in the recycling rate. The former should be recognised as a welcome development, whereas the latter reflects changing patterns of consumption. This should prompt new innovation in the waste sector to deal with these types of waste. For example, by developing improved recycling methods or technology to deal with different types or combinations of materials. So the current preoccupation with the headline recycling rate may be unhelpful. If the concern is the impact that excessive waste is having on the environment, then less recycling due to less waste being generated in the first place should not be a cause for concern. If the drop in recycling reflects changing consumption patterns, any penalties should be aimed at generating incentives to innovate in terms of packaging and new and better ways to deal with different types of waste. We need better analysis to identify the true causes of any change in recycling patterns, and the legislation – designed to drive greater recycling – should recognise why these two situations are different. It may be that green fatigue is one cause among several. To the extent that a lack of information or sheer inconvenience exacerbates the problem, there is evidence to show that improving both these aspects does promote recycling – particularly among those whose attitude is not especially pro-environmental. On the other hand, if the only means to make recycling more convenient is through co-mingling, there is the valid point that the risk of contamination is high and levels of useful recycling may actually fall. Research indicates that there are several factors that underpin the rate of recycling, from the way the service is provided, to whether recycling is considered a social norm among families, communities or groups banded by age, ethnicity or location. Perhaps the role for government in tackling any dip in the recycling rate is to highlight the prevalence of recycling among certain groups as a way to demonstrate the existence of that recycling norm – and by doing so, encourage it in others. Lucy O’Shea received funding from the ESRC.